Dunnigan, Brian Leigh. "Fort Michilimackinac". The Canadian Encyclopedia, 04 March 2015, Historica Canada. https://www.thecanadianencyclopedia.ca/en/article/fort-michilimackinac. Accessed 25 April 2019. Fort Michilimackinac (Michigan) refers to three distinct military posts at the Straits of Mackinac between lakes Huron and Michigan. French explorers arrived by 1634, establishing a mission on the north mainland in 1671 and a fort in 1690 (St Ignace, Mich). Fort Michilimackinac (Michigan) refers to three distinct military posts at the Straits of Mackinac between lakes Huron and Michigan. French explorers arrived by 1634, establishing a mission on the north mainland in 1671 and a fort in 1690 (St Ignace, Mich). A new stockade was erected on the south shore (Mackinaw City, Mich) in 1715 and held until the arrival of British troops in 1761 during the Seven Years' War. Captured by the Chippewa during the Pontiac uprising of 1763, Michilimackinac was reoccupied a year later. The post was moved to the nearby and more secure Mackinac Island (Mich) during the American Revolution and was given up to the US in 1796. Michilimackinac had its only military action during the War of 1812. Under the command of Captain Charles Roberts, a 600-man British, Canadian and Aboriginal force from Fort St Joseph landed on the night of 17 July 1812, one month after the outbreak of war. They placed a cannon on high ground behind the fort and knowing that the 61-man garrison was unaware of the beginning of hostilities, demanded its surrender. Recognizing the superior force, the American commander, Lieutenant Porter Hanks, accepted the terms. By their victory, the British gained control of the Northwest; they subsequently built Fort George in 1814 to command the island's highest point. The British remained unchallenged until July 1814, when a US naval squadron appeared off the island with 750 troops aboard. The elevated position of Fort Michilimackinac prevented the ships' guns from bombarding it effectively, so the squadron's only alternative was to land the army 3.2 kilometres to the north. 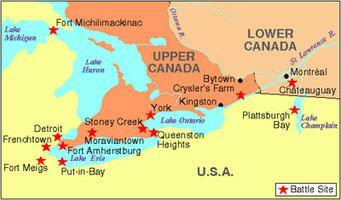 The US troops went ashore on 4 August and were opposed by the British and their Aboriginal allies. The ensuing Battle of Mackinac Island was inconclusive, and the US force withdrew. In a final attempt, the naval commander assigned the gunboats Tigress and Scorpion to maintain a blockade. This was effective until a force from Michilimackinac surprised and captured the vessels in early September (3 to 5 September). Returned to the US in 1815, Fort Mackinac, as the island post is more commonly called, protected a major fur-trading centre until the 1830s and was garrisoned until 1895. In that year, it was given to the state of Michigan for use as a park. Today, two of the forts are open to the public as museums. Visitors to Fort Mackinac can see its stone walls and four buildings contemporary to the War of 1812, the 1814 battlefield and the ruins of Fort George. The 1715-1781 fort on the south mainland has been reconstructed. Brian Leigh Dunnigan, The British Army at Mackinac, 1812-1815, Mackinac History and Archaeology, Number 7 (1980, reprinted in 1992) and A Picturesque Situation: Mackinac Before Photography, 1615-1860 (2008); E.O. Wood, Historic Mackinac (1918).